The City of Toronto will be carrying out waterproofing and structure rehabilitation work on the Rosehill Reservoir at David Balfour Park. These necessary upgrades will help to ensure the structural integrity of the reservoir, extend its service life and bring the infrastructure to a state of good repair. Parks staff will be reaching out to families who have memorial trees and benches in and around David A. Balfour Park. Some records contain family contact information that is out of date, such as phone numbers no longer in service. Please contact commemorativeprogram@toronto.ca if you have questions about the plans for the memorial plaques after the construction work is completed and to make sure your family’s tree or bench is included. Update #18, March 27, 2019. Around 100 residents attended last night’s meeting. If you weren’t able to join us, please see the presentation with annotations to learn more about the park design. Please send us your feedback by April 5, 2019. What do you like about the park design for David A Balfour Park? What are your concerns or questions about the park design? Today is the start date for Phase 2A construction. Hoarding will go up in the eastern and south section below the Garden. See the map for Phase 2A. One (1) memorial tree located in Phase 1 hoarding will be removed. Parks staff are in contact with the family to determine where a new tree will be located. Three (3) trees are located at the south-east corner of the park on top of the reservoir. These three (3) trees must be removed to carry out structural rehabilitation to the reservoir. These four (4) trees removals will take place today, Wednesday March 27 to Friday March 29 to ensure they are removed before the Bird Migratory Protection Act. Access to Rosehill Garden will remain open and a southern portion may be temporarily closed to ensure a safe work zone around these trees. The playground may be closed for safety purposes. 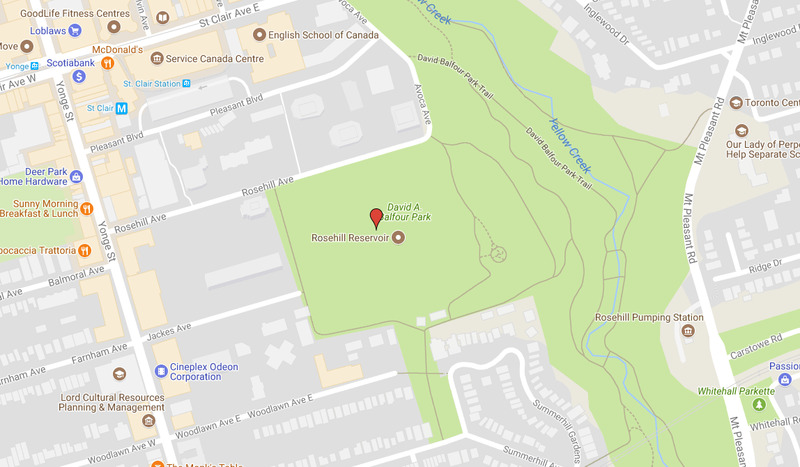 Trees will be replanted in a variety of locations around Rosehill Reservoir to coincide with the upgrades to David A Balfour Park. Update #17, March 7, 2019. A new design for David A Balfour Park! Join us at a public meeting to learn about enhancements to David A Balfour Park! Date: Tuesday March 26, 2019. Time: Doors Open 6:30 p.m. If you cannot attend, the presentation and display materials will be posted on the webpage the day after the meeting. Park amenities, such as seating, benches, picnic tables, trellis. Send us your comments and questions by Friday April 5, 2019 and contact us with accessibility requests 416-392-1932. Update #16, January 17, 2019. Advancing the start date for work on the eastern perimeter area, below the reservoir’s slope, which was originally scheduled for Phase 2 this Summer. The blue area from the playground towards the Summerhill Entrance will be temporary closed for 3 weeks to carry out tree protection and removals. Notice will be provided if this closure affects access to the Garden. The Construction Notice has clarified a detail on Page 2, second row, first column and indicates Phase 2A from February 4, 2019 to July 31, 2019. If you would like to receive email updates about this project, please contact Kate Kusiak at rosehill@toronto.ca. Construction Update #5 January 17, 2019. A Construction Notice was provided to update the community that Phase 2 schedule was advancing in two parts, Part 2A from Feburary to July, 2019 and Phase 2B which keeps with the original schedule starting in August to December, 2019. Construction Update #4 November 28, 2018. A Construction Notice was provided to update the community that the public washroom will be demolished. Construction Update #3 October 26, 2018. A Construction Notice was provided to update the community that work will be starting on Saturdays. Construction Update #2 October 17, 2018. A Construction Notice was provided to update the community on the tree root exploration activities along the eastern perimeter path. Construction Update #1 August 10, 2018. A Construction Notice was provided to update the community on the temporary pathways and washroom access. Members of the public were invited to drop in to learn about the rehabilitation of the reservoir, the details of the construction process, and efforts to mitigate impacts on the community. City of Toronto staff were present to answer any questions and receive feedback from the public. Starting in 2015, the project team met with local stakeholders, permit holders, schools, and other groups that use the green roof of the reservoir regularly. Notices were distributed to area residents and signs have been posted on site. Thank you to all who attended the Rosehill Reservoir Rehabilitation Public Meeting on September 13, 2017 at Yorkminster Park Baptist Church. If you were unable to attend the meeting, you can view the presentation slides. On October 13, 2016 the project team was invited to give a presentation to the Summerhill Residents Association on the preliminary state of the project. You can view the presentation slides below. Please note that the timelines in this presentation are outdated. The most updated timelines are included in the May 31, 2017 Rosehill Vision Committee Meeting Presentation. On May 31, 2017 the Rosehill Vision Committee (comprised of neighbourhood residents) held a community meeting to discuss their proposed plans for the green roof of the reservoir and Little Park. The Committee kindly invited City staff to attend the meeting and give a brief presentation that outlines the revised project schedule. View the presentation slides. On October 26, 2015 the City distributed a notice to properties adjacent to David A Balfour Park regarding a tree inventory to be completed in the first few weeks of November. View the October 26 Notice of Site Work. On November 10, 2015 the City distributed a notice to properties adjacent to David A Balfour Park regarding survey work to be completed from mid-November to mid-December. View the November 10 Notice of Site Work. The Rosehill Pumping Station located at 240 Mount Pleasant Road in Toronto, south of St. Clair Avenue, is one of the eighteen pumping stations operated by Toronto Water. In 2008, the City of Toronto conducted a study to evaluate system sustainability during a City wide area power failure. One of the recommendations from this study was the installation of standby power at Rosehill Pumping Station, which include building extension to house 2 generators and a fuel storage tank. In 2013, the City of Toronto also conducted a system-wide review of its drinking water infrastructure and determined through this process that the Rosehill Pumping Station requires rehabilitation to bring to a state of good repair. It is the City’s intent is to realize efficiencies by combining the rehabilitation work and the standby power installation into one project, the Rosehill Pumping Station Rehabilitation and Standby Power Installation. This project is expected to be completed by the Spring of 2020. The Rosehill Reservoir stores and provides drinking water for approximately 675,000 residents located in downtown Toronto. It is vital in managing water distribution in the City as well as ensuring a constant supply of water is available during emergencies such as fires, water main breaks and power outages. The reservoir was originally built in 1873, making it the oldest and largest of the ten ground level reservoirs located in the City. The last rehabilitation took place in 1966 and the current rehabilitation activities are expected to last for another 50 years. This work will extend the reservoir’s service life, bring it into a state of good repair and meet improved provincial guidelines for safe drinking water. Replacing the waterproofing membrane on top of and one metre down the side walls of the reservoir. This require the removal of park features, trees and soil from the top of the reservoir and partly down its slopes. Reinforcing, patching the reservoir’s interior structures, such as its walls, columns and joints. Replacing and upgrading the mechanical and electrical systems that operate the reservoir within the water supply and distribution network. Cleaning, upgrading, replacing related infrastructure around the reservoir, such as the watermains, storm sewer system, footing drain systems, as well as the Access and Valve House located on the south side of the park. The Rosehill Garden will be reinstated in its original location on top of the reservoir. The landscape plan will be developed and shared with the community once the design concept has been finalized. The contractor will install the park elements once the rehabilitation work is complete. Improvements to the playground is not part of the rehabilitation contract or park enhancement plan. During Phase 1, structural rehabilitation and waterproofing work over the West Cell/Basin will be completed. This work will require the closure of the west side of the park, and will continue until the park features in the enhancement plan are installed. Phase 2A will advance the work along the lower perimeter pathway south of the washroom around the playground towards Little Park/Summerhill Entrance. Within Phase 2A, a three-week temporary closure starting late February, around the playground and outer perimeter path is required to remove and install tree protection zones. If this three-week closure will affect access to the Garden, a Construction Notice will be issued in advance. 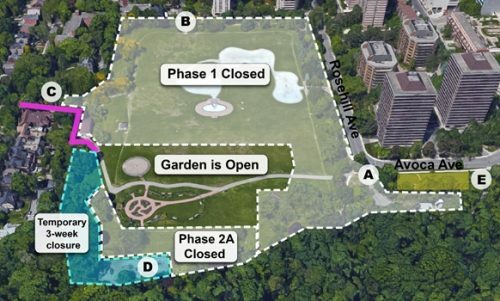 Phase 2B includes a full park closure as per the original March 2018 Construction Notice. At this time, rehabilitation and waterproofing work over the East Cell/Basin will begin. Phase 3 will complete the rehabilitation work and park features installation prior to the end of the project in Spring 2021. Construction updates will be provided prior to these milestones. Work will take place Monday to Fridays starting at 7 a.m. to 7 p.m. and on Saturdays starting at 9 a.m. to 5 p.m. Soil removal, removing existing waterproofing membrane and the process to install a new membrane (and replacing soil) is weather dependent and unfortunately the rain and wet weather has impacted the schedule in Phase 1. Work on Saturdays is required to recoup this time and meet the completion date. See the City’s Noise By-Law for more information and previous Construction Notice for Phase 1 Saturday Work. The City previously committed to providing access through the park and around construction. However, due to concerns raised regarding the safety of the temporary pathways, access from Rosehill/Avoca avenues was closed off. Please read this construction notice for more information. During Phases 2B and 3, the park will be fully closed and no access around the construction will be provided. The City is making every effort to minimize the number of trees that will be removed or impacted. The project team is working closely with arborists, landscape architects, City of Toronto Forestry staff and the Rosehill Vision Committee’s dedicated arborist to determine tree protection zones (TPZ), impacts, transplants and removals. The City has directed the contractor to carry out a Tree Root Exploration process to expose the tree roots (which does not damage the trees) for arborists to determine its conditions in review of the rehabilitation activities and park design. Trees located on top of the reservoir and partially down the slope will be removed and not replanted. A replanting plan is being developed as part of the park enhancement design. This plan will address trees that were removed during construction. Memorial trees will also be included in this plan. The City Forestry staff have reached out to family members of dedicated trees and benches to work together and determine where those impacted trees can be replaced. Some records have family contact information that is out of date, such as phone numbers no longer in service. Please contact commemorativeprogram@toronto.ca to ensure your family’s memorial tree or bench is included in the replanting plan. In addition the park trees, the Rosehill Garden Volunteers have worked closely with the project team to transplant a number of plants from the original garden to the expanded Avoca Beds prior to Phase 2 work. These plants will be reinstated back to their location in the Garden near the south-east corner of the park after rehabilitation work is complete. The main access point or hub of rehabilitation and truck activities is located at the north-east corner of the park at Rosehill Avenue and Avoca Avenue, as it is off of the reservoir structure, and has sufficient space to transfer removed soil into trucks and make deliveries for the north-end of the reservoir. All exterior and interior work activities, such as soil removal and delivering equipment and supplies, will use this access point, with the exception of work at the Valve House and Summerhill Entrance/Little Park. Trucks will also be required to access the Valve and Access House located at the south end of the park via Summerhill Avenue, as these are the entry ways to much of the reservoir’s mechanical and electrical systems. Jackes Avenue will be a third access point to allow watermain connection activities to be carried out. The City has worked with the contractor to minimize the number of trucks at Jackes and Summerhill Avenue by redirecting trucks that would remove soil at the south end of the park, to the Main Access Point at the north end of the park. Trucks required to make deliveries at the Valve House located near Little Park/Summerhill Entrance require a large turning radius. Staff have worked with residents and the City’s Permit Parking staff to use about four car spaces on the south curb at the foot of Little Park for these deliveries. The benefit of this arrangement meant that park plantings and features in Little Park were not impacted or removed. Please see the Phase 1 Notice for more details. Another notice will be issued to continue this arrangement in Phase 2A. Dogs are required to be on-leash (Toronto Municipal Code Chapter 608- section 34) as there is no dog off-leash area (DOLA) in this park. Signs have been posted on construction hoarding asking dog owners to keep their dogs on-leash. Please email 311@toronto.ca or phone 311 to request by-law enforcement for dogs off leash.